With the growing trend of improving diets, more and more people are beginning to watch what they eat. After all, ‘you are what you eat’, no matter how old the saying is, makes for a very valid point. My advice to anyone wishing to know what exactly it is they are putting into their mouths, is to grow their own. It is one of the best ways to fundamentally reconnect and improve your relationship with food. Whether you choose to lend your crops a helping hand with the use of chemicals or want to grow organically, it’s your prerogative. However, there are a few things you need to bear in mind, which is detailed below in my beginner’s guide to growing your own. No matter how large or small a space you have to work with you can always find room to become self sufficient. Whether you have space for a greenhouse, wish to construct raised beds, acquire an allotment space or simply have a spare windowsill or patio for some containers, you’re sure to build yourself a haven for vegetables and herbs. If looking to turn your garden into an outdoor kitchen bear in mind that vegetables need moist soil and a lot of sun. Search for a patch that attracts a lot of sun and is not prone to flooding. You may also want to ensure the patch is not too rocky as this can determine what you can grow, but by taking some time out of your day and removing unwanted rocks, you’re sure to create the perfect vegetable patch. This is extremely important to know. 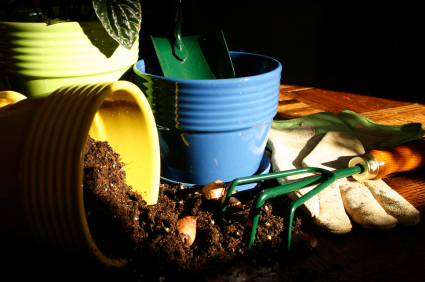 You need to know off the back of your hand what environment you’re placing your plants or seeds in. A successful gardener understands what crops can be grown in an acidic or limey soil. It is known that vegetables grow well in a slightly acidic soil with a pH level of 6.5 (just shy of pH7, which is neutral). You can determine the characteristics of your soil by testing it using a soil test kit that can be found in most garden centres. If your soil is acidic the solution will turn orangey-yellow and may require some garden lime incorporated into the soil to raise the pH level. However, if your soil is neutral the solution will turn green and an even darker green if it’s alkaline. The soil content must not be too sandy or too high in clay and the intended patch should have good drainage. To test the drainage of your soil, fill the area with water and if there are still puddles the next day, your soil’s drainage is too poor. With pots and containers line the bottom with broken pots or bricks and incorporate some sand if the soil is high in clay. As many plants need to be in the ground by spring, you need to ensure your plot is in the correct condition. It should be weed-free, which can be accomplished by digging it over and removing the weeds by hand, ideally placed next to a sunny wall and have an organic fertiliser incorporated into the soil. I have always found it best to add about a bucket of well-rotted manure per square yard of your plot. Digging over your soil can be achieved with a shovel or rototiller. Many rototillers can be borrowed, but this is one tool that you should have in the shed along with a hoe and hand-held tined instruments. If you have a small garden, my advice to you is to consider a raised bed. This has many advantages; it is easier to tend, the soil can warm up and dry out quicker, which in turn can produce better yields and as your adding further soil on top of the ground, there is more room for your plant’s roots to grow. Once you have prepared your plot, you can begin to plan it. Think of what you would like to grow and start with one or two plants of each species. Decide whether you would prefer to grow from seed or plant. Less effort is required with young plants, but seeds are a fun experiment; transferring them from pot to plot. Once a wish list of your desired crops has been created, pop into your local garden centre and talk to staff about the requirements these plants need, such as planting times and the room required to grow successfully. You may also need to consider the local wildlife. If you live in an urban area netting and other shields may be needed to protect your yields from birds. Whereas, if you live in the country and wildlife is in abundance, fences and other sturdy structures may need to be put in place. Many young vegetable plots comprise of annuals or plants that last one year and require replanting every spring. Its best practice to avoid experimenting too much, grow what you know and like before venturing into the unknown. If you have a small plot, shun away from anything that requires a lot of space and for the time being, any vegetable that needs elaborate preparation. Why not try some dwarf varieties rather than rambling crops and make the most out of any fences or walls to grow climbing crops such as peas? Just because you’re keeping to what you know, it doesn’t mean that your plot has to be boring. Look out for vegetables and herbs that are ornamental as well as edible. Ensure to tend to your vegetable patch and you’ll be harvesting strong and nutritious yields in a matter of several weeks. Mr McGregor is a writer for Notcutts, an online gardening store who specialise in all things horticultural. As an enthusiastic gardener, Mr McGregor loves to share his experiences and advise, retaining a regular blog spot on the Notcutts blog.